From trade deals to living-wage campaigns to student-debt relief, whose side is candidate Clinton on? Hillary Clinton’s long-awaited announcement that she’s ready and running for president touched off saturation press coverage that other contenders can only envy. The former first lady, senator, presidential candidate, and secretary of state has been in the public eye for nearly a quarter of a century. She’s the prohibitive favorite to get the Democratic Party nomination this time, and the odds-on favorite to win the presidency. Yet hurdles remain. Clinton’s challenge isn’t to capture the middle from the Republicans; the GOP’s rightward lurch has already virtually ceded that ground. Rather, it is to inspire the Obama coalition—made up of people of color, millennials, and women—to vote in large numbers, not only to guarantee her victory but also to help Democrats take back the Senate, gain seats in the House, and secure a clear mandate. If the first video that her campaign released is any indication, Clinton at least understands the task ahead. The hard-working “white Americans” who formed the backbone of her 2008 bid were still there, but they were artfully blended into a rainbow coalition of optimistic faces: an African-American couple expecting a child, Latino brothers opening a restaurant, a young Asian-American woman looking for a job, and a gay couple engaged to be married. Multiculturalism will certainly set Clinton apart from the eventual Republican nominee, but diversity alone won’t be enough. As she herself acknowledged, at a moment when “the deck is still stacked in favor of those at the top,” the central question is about the economy. What is needed to make it work for all Americans—to rebuild a broad middle class, increase wages, and reduce inequality? Clinton’s newfound populism sounds sincere, but there is every reason to ask whether the candidate—whose campaign is expected to raise as much as $2.5 billion by relying heavily on wealthy donors—shares the vision of grassroots Democrats about how best to achieve these goals. A growing debate rages inside the party, symbolized by the split between the Wall Street and “Elizabeth Warren” wings, with the latter still campaigning to draft the Massachusetts senator into the race. Clinton will find herself forced to decide where she stands in relation to this divide. In April, for example, a resolution to give the president fast-track trade authority will be introduced in the Senate. The measure is designed to ease passage of the Trans-Pacific Partnership accord. President Obama, joined by the GOP leadership and much of the Fortune 500, is pushing for fast track and the treaty. The vast majority of House Democrats is opposed, as are progressive senators like Warren, Sherrod Brown, and Jeff Merkley. Potential rivals for the Democratic nomination—Senator Bernie Sanders, former Maryland governor Martin O’Malley, and former Rhode Island governor Lincoln Chafee—are also opposed. Does Clinton stand for a continuation of the trade policies championed by her husband, which have racked up over $6 trillion in trade deficits since 2000 and ravaged domestic manufacturing jobs? Or does she oppose such agreements as one of the ways the rules are rigged against “everyday Americans”? On April 15, tens of thousands of low-wage workers from across the country will walk out in some 200 cities, demanding a $15 minimum wage and the right to form a union. 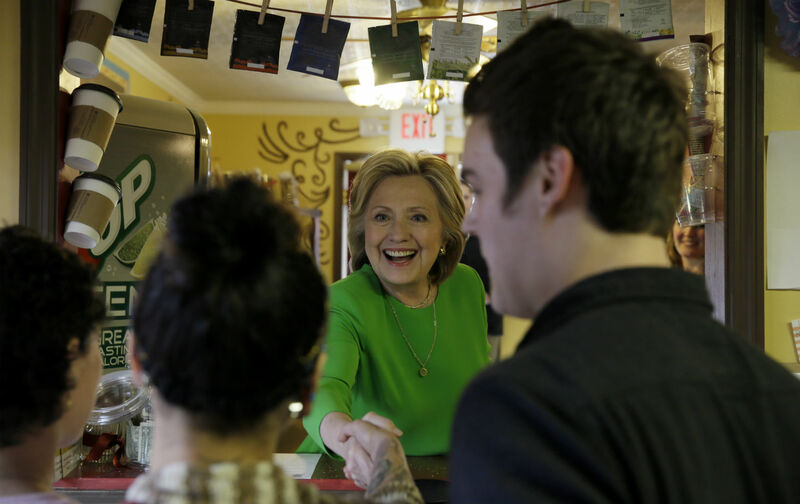 Clinton favors raising the minimum wage, but will she join the fight for $15 an hour? Will she speak forcefully about empowering workers to organize and bargain collectively, or will she try to duck the issue? With boomers retiring without pensions or adequate savings, progressives have proposed expanding Social Security benefits, and also removing the current income cap (annual wages above $118,500 are not taxed by Social Security) as the first step in covering the costs. Obama, by contrast, has proposed cutting Social Security benefits as part of a “grand bargain” with the Republicans on deficit reduction, a position greatly appreciated on Wall Street. Clinton, like all Democratic candidates, will promise to protect Social Security, but will she support expanding it? Student-debt strikers have launched a campaign to cancel federal student debt. Senator Warren has also laid out a clear plan for relief: allow any student with federal loans to refinance at government-subsidized rates, currently below 4 percent. Warren proposes enacting the “Buffett Rule,” which would impose a minimum 30 percent effective tax rate on people who earn over $1 million annually, to pay for it. Would Clinton support such measures? On these and other matters, Clinton will be tested by progressives throughout the presidential campaign. New York Mayor Bill de Blasio, who pointedly declined to endorse her, has proposed collecting thousands of signatures for a Progressive Contract With America and hosting a bipartisan presidential debate on inequality. Likewise, the Campaign for America’s Future has formed an alliance with three major grassroots organizations—National People’s Action, USAction, and the Alliance for a Just Society—to drive a populist platform into the political debate. And Clinton may also face stiff challenges from her potential rivals. Webb has been a compelling critic of our trade policies; O’Malley has called for reviving the Glass-Steagall regulations repealed by Bill Clinton; Chafee has called Clinton “a little too close to Wall Street”; and Sanders has eloquently challenged the corruption of big-money politics. By vowing to be the champion of “everyday Americans,” Hillary Clinton has shown that she can read the populist temper of the times. Now she’ll have to make good on that promise.